* I'm always amazed how poorly traders perform in job interview situations. Here is what years of experience, both as an interviewee and an interviewer, have taught me about winning at the job interview. 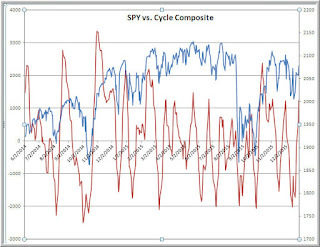 * The weakness yesterday has continued into early trading today, raising the odds that we've seen a price peak for the current cycle. 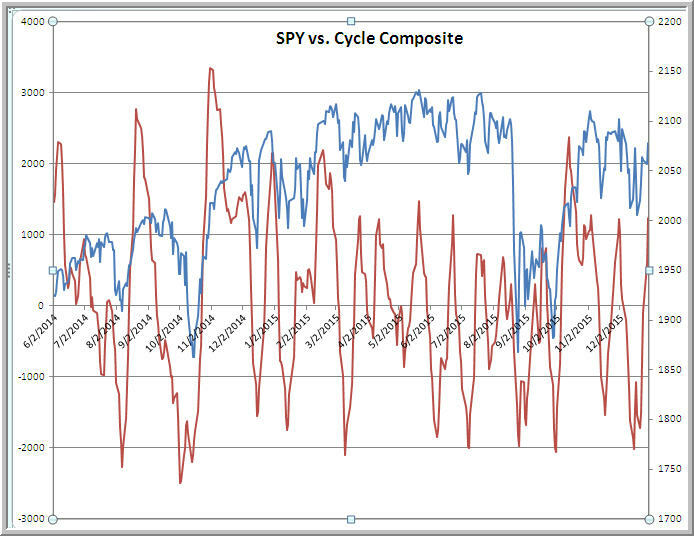 If that is the case, we could see a meaningful correction back toward prior cycle lows. 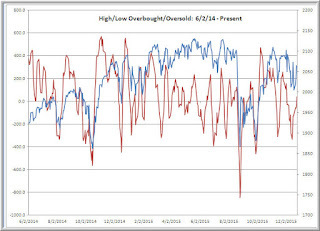 As has been the case for a while, weakness in the oil market has accompanied stock weakness. 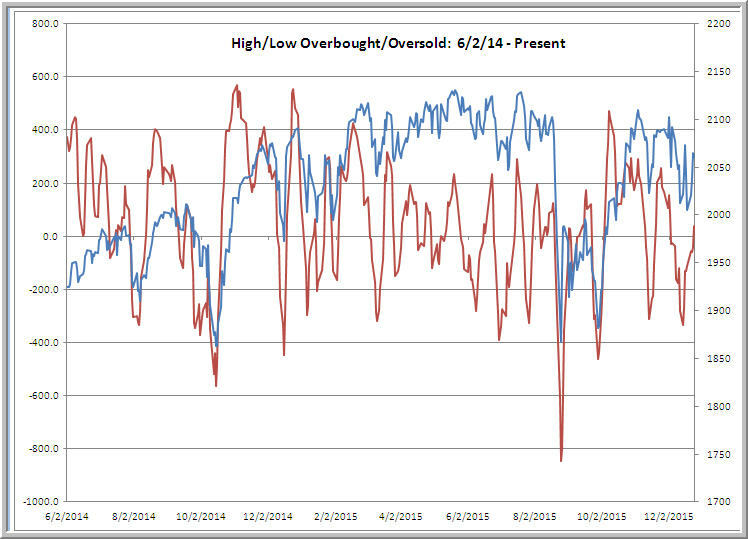 * Here's where we stand with my favorite intermediate-term overbought/oversold measure. It appears to be cresting, as do my cycle measures. My best wishes to readers for a happy, healthy, and profitable 2016!! * I was looking for signs of weakening breadth in Tuesday's session and what we got was the reverse: consistent buying through the session, accompanied by strength in commodities. 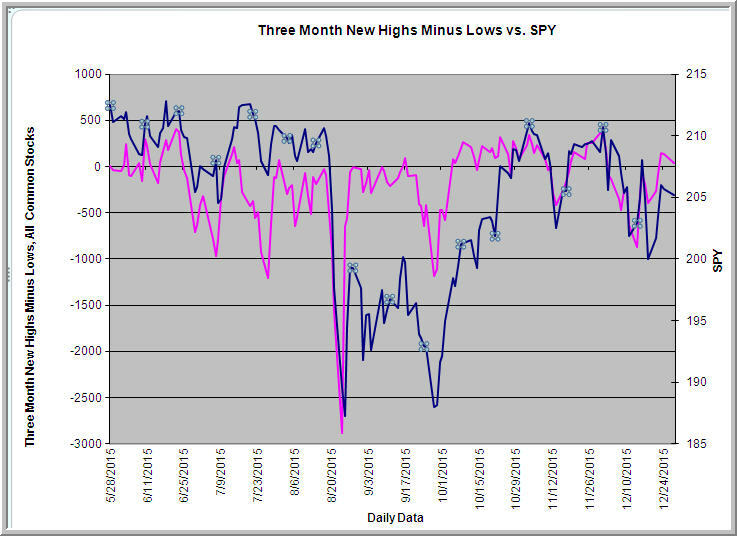 New highs among SPX stocks, as well as across all exchanges, hit their highest level since early December. 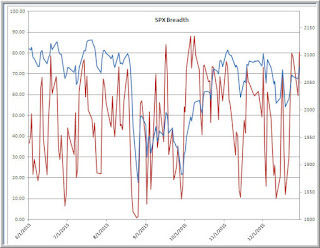 The chart of breadth among SPX stocks only shows that we continue strong, with over 80% of stocks above their 3, 5, and 10-day moving averages. 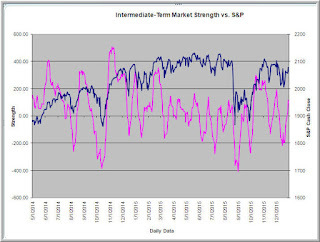 While profit taking from such levels is not at all unusual, that breadth strength is not typical of a market about to morph into a bear. * My five-day measure of selling pressure is at unusually low levels, meaning that it's been as much the absence of selling as the presence of huge buying that has lifted the market recently. 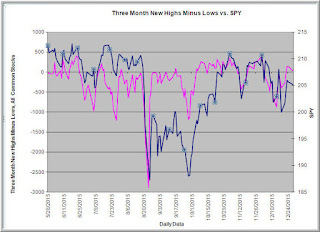 Past occasions when we've seen similar low selling pressure levels have been late December, 2014; late February, 2015; the third week in March, 2015; and the third week in May, 2015. 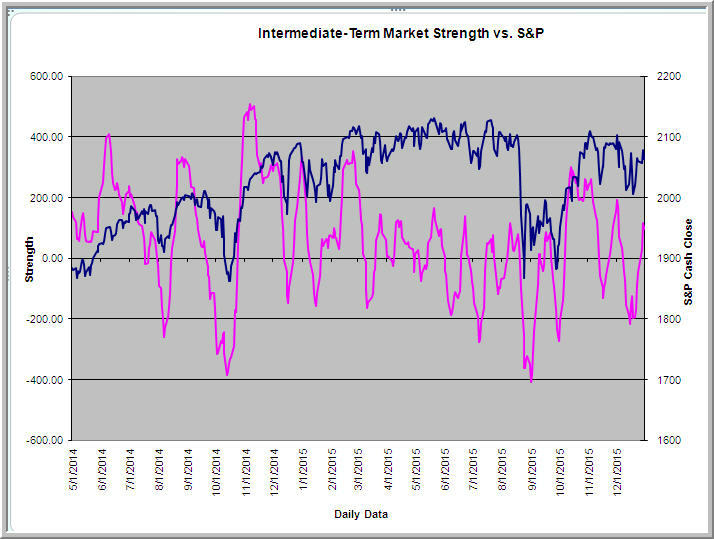 All led to short-term moves lower within a matter of days. * The relative weakness in commodity related sectors (XLB, XLE, XME) continues, as does relative weakness among high yield bond funds (JNK, HYG) and emerging market stocks (EEM) and China (FXI). 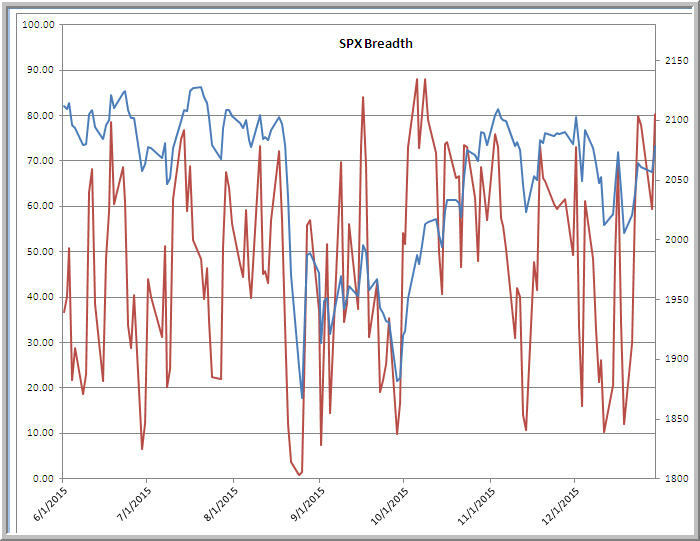 These continue to be on my radar, as they are significant drags on stocks overall. * Friday's partial session finished with a late decline, which has continued into the overnight session, as stocks seem to be following oil prices. I continue to look to commodity and credit markets, as well as the relative performance of emerging markets to developed markets, to update views on deflationary impacts upon the global economy. It is difficult to envision a bull market environment if we're seeing falling commodities, yield curve flattening, weak emerging markets, and distressed credit markets. * A few of my overbought/oversold measures are not at levels normally seen at market tops, so I'm open to the possibility of some back-and-forth movement this week. Should we work off the prior oversold level in time more than in price and put in a lower high, that could set the stage for a stronger downward move. * It would not surprise me to see light trading this week, given many traders' desire to take time off before the new year. Low volume generally accompanies narrow ranges. So far, however, the day's downward move in oil is not a small move. This is worth watching.